Tasty, hot and healthy meals - in super quick time! We bring you all the information you need about halogen ovens - the easy way to cook delicious hot and healthy meals in extra quick time. These ovens are all the rage in the UK so it's time to get on board and start cooking with one of these mini marvels. 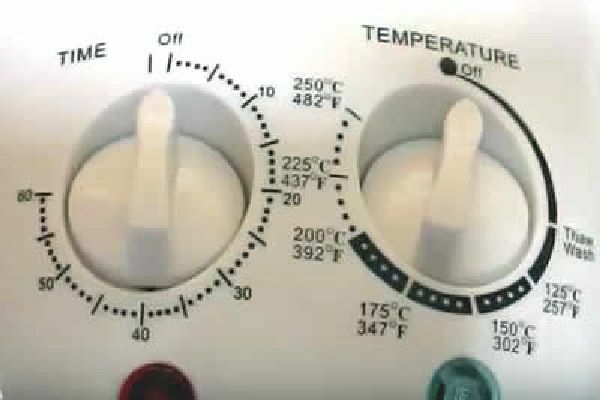 We give you the full low-down on the types and makes of oven available, how to use one and some of the great hot and tasty meals you can rustle up much more quickly and efficiently than you could if using a conventional oven in your kitchen. The Halogen Oven - High on Taste but Low on Fat! A halogen oven is an amazing little cooking unit when it comes to preparing fast, tasty and healthy meals in your kitchen - their popularity is booming as more and more people get wise to the wonders of cooking with halogen power. Our aim is to provide you with all the information, tips and advice you need when it comes to finding the oven that's just right for you - and we've also tracked down the best UK deals around. These light and portable ovens cook food to perfection by circulating air which has been heated by a halogen bulb - and many people use one as a time-saving alternative to their conventional oven. The bulb or lamp inside a halogen oven powers up to create an instant and intense heat, and this in turn cooks your food just like a normal oven. Energy is transferred directly to the food molecules without passing through an intermediary such as air, water, oil, etc. Therefore the desired temperature will be reached more quickly and food will cook much faster. These handy self-contained units are really simple to use and can save you time and money in the kitchen. We give you all the guidance you need - from outlining the benefits of using a halogen oven and how they work to suggesting things to consider when buying one. We also tell you about some of the most popular meals you can make in these self-contained little cookers. You can use the halogen oven for almost anything which you would usually cook in a microwave or standard oven including chicken, roast meat joints, burgers, vegetables, pizzas, casseroles, curries, stews, jacket potatoes - and much more. We feature an impressive range of quality halogen ovens from major UK kitchen accessory and electical appliance store and you'll find all the leading oven brand names here including Russell Hobbs, Elgento, VonShef, ElectriQ, Sentik , Andrew James, JML, Homegear, Designer Habitat, Breville and Jack Stonehouse. A halogen oven is essentially a mini fan oven, meaning it cooks hotter than a conventional oven which is not fan-assisted. The speed associated with using a fan, combined with the instant halogen heat from the bulbs, means a halogen oven cooks incredibly quickly and efficiently. A halogen oven may look like a low-tech gadget but it is guaranteed to revolutionise the way you cook and takes up much less space than a conventional oven or microwave. It is also sometimes referred to as a halogen convection oven or cooking pot. This type of oven enables you to roast, fry, steam, bake, stew, sear, toast, grill or reheat food faster without compromising on taste - and its cost effectiveness means it can help to cut your electricity bills too. Defrosting is very quick in a halogen oven by using the low temperature thaw setting and the process does not leave any hot or cold spots. Halogen ovens can be used for grilling, defrosting, steam boiling, baking, broiling and roasting - so what you can cook in them is only limited by your imagination. Using a halogen oven is simplicity itself and needs little or no previous cooking experience. Speed is a key bonus with a halogen oven - it can take up to three times less to prepare a meal than with a traditional oven. Now that's impressive! 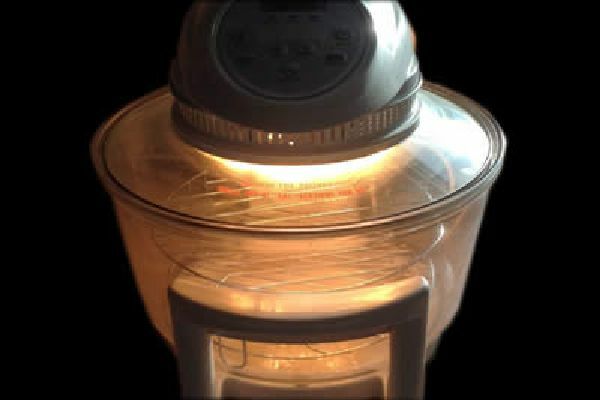 The first ever halogen oven was designed in 1995 by a undergraduate student in Computer Science attending school at University of Iowa, United States. But a pool of brainiacs helped finish the product before it was ready to be marketed. Using a halogen oven is simplicity itself and needs little or no previous cooking experience. All the cooking takes place in a transparent glass bowl so you can acutally watch the whole process from start to finish. We're convinced you'll fall in love with a halogen oven soon after buying one, as thousands of happy owners have done before you - it's a purchase you certainly won't regret. An obvious health benefit of using a halogen oven is that there's no need to add extra fats or oils when preparing a meal - and any fat that arises as a result of cooking is drained away very efficiently. That's great news if you are health-conscious and also if you are watching your weight. 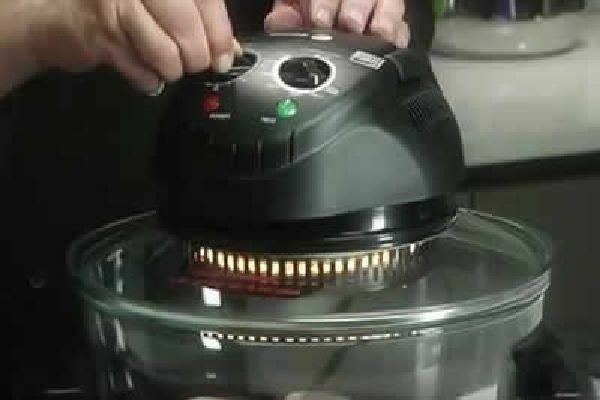 We discuss the benefits of owning a halogen oven in detail on this site, but here's just a few of them at a glance. Prices for these fantastic little devices range from around £25 for a cheap model to more than £70 for a top of the range model with additional features and spare bulbs. The most common oven capacities is 7, 12 15 and 17 litres, so you are catered for whether you want a small or large device. With their energy saving benefits you should be able to recover the cost of the oven quite quickly, by way of a reduction in your electricity bills. Some halogen ovens can be fitted with an air fryer attachment which allows you to cook chips and other foodstuffs in the way your would with a traditional oil-filled deep fat fryer - however an air fryer requires only a minimal amount of oil. It works by using revolutionary Rapid Air Technology to circulate air at 200°C around food. Other handy halogen oven accessories featured here to enhance your cooking experience include cooking extender racks for cooking larger items such as a whole chicken, a compact rice steamer, tongs and skewers, a digital thermometer to test food is cooked properly, baking trays and the popular full English breakfast rack which has sections for your eggs, sausages, bacon, hash browns and a toast rack. We also bring you a range of useful cook books which are packed with tips and recipe ideas for meals to try out. Halogen ovens certainly create very tasty meals - but they are not magical devices that will suddenly turn you into a master chef! If you're not great at cooking in a conventional oven, the same recipes aren’t going to suddenly taste stunning in a halogen oven. If you have limited cooking skills it's probably worth buying a book with a variety of halogen oven recipes - this will help you get the best results from the device. 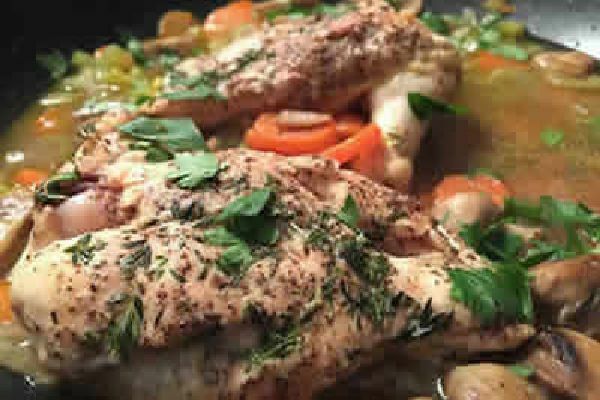 You'll be amazed at the range of foods that are truly scrumptious when cooked in a halogen oven - full chickens turn out golden brown and yet not dry. It's fair to say most meats turn out really delicious when cooked in these innovative devices - but without the fuss and mess associated with standard full-size ovens. You even get crackling on your pork joints when using a halogen. Steaks can be prepared to perfection and even bacon comes out just the way you want it - that's something you won't achieve in a microwave! Halogen ovens are available to buy at major UK stores including Maplin Electronics, Homebase, Tesco, Quest, Abode, Your Kitchen, Argos, Ideal World, Debenhams Extra, John Lewis, Currys, Coopers of Stortford, Amazon, eBay and Appliances Direct. We feature ovens from many of these reputable stores. A real eye opener when you invest in a halogen oven is how well they cook meats, fish, veggie dishes and even pizzas - things you just can't prepare as successfully and tastily in a microwave oven. If you are single and want to cook a quick and healthy meal, rather than opting for a less healthy fast food alternative, a halogen oven makes a lot of sense - it's just not economical to use a full-sized oven for making one-person meals. These ovens are small, fast, easy to clean, super energy efficient and are perfect for singles or couples who wish to cook without the hassle involved in using a full-size conventional gas or electric oven or stove top. You really do get the best of both worlds - they can cook as fast as a microwave but can brown your food in the same way a normal oven can. As mentioned earlier, a microwave cooks food by bombarding the food with microwaves and heating the food from the inside out. Hence there is no heat emitted by the microwave and that's why it's unable to brown food or make it firm and crusty. As you can see - a halogen oven really is an amazing cooking device. Hopefully we can help you find the ideal oven for your needs so you can get down to some serious cooking with halogen power! More expensive halogen ovens come with greater capacity, more features and often a range of extra accessories. However, the majority of ovens comprise a basic core of components. They all come with a large heat resistant glass bowl where all the cooking takes place. Above this a large lid which houses an air blower fan and the halogen bulb which cooks the food. A handle is built into the lid which allows it to be removed from the top of the glass bowl. The handle also enables the oven to be started or stopped, normally by pressing it down to start the device and lifting it up to stop it operating. Another core element of any halogen oven is a metal cradle with handles on the side where the glass bowl is positioned during the cooking process. These handles allow the oven to be moved safely after use without any risk of burning your hands. High and low round metal racks and a pair of food lifting tongs also come with any halogen oven. Many also include a metal extender ring which can be positioned betwen the glass bowl and lid to increase the capacity of the oven. The fact you don't need to pre-heat a halogen oven before use is a significant bonus when it comes to energy saving, which is great news when you also take into consideration the lower running costs as a result of meals cooking more quickly than a conventional oven. When it comes to choosing which type of dish, tray, bowl or other food container to use in halogen oven, it's pretty much a case of anything goes! Practically any receptacle that can be used in a standard oven will be suitable for a halogen cooker - assuming it is round in shape! 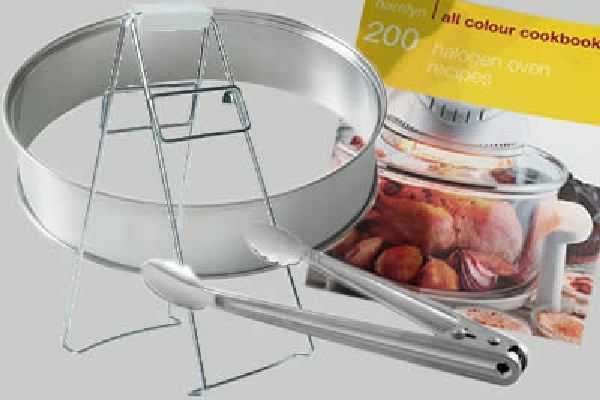 Stainless steel, glass, metal, cast iron, wrought iron, non-stick aluminium, tin foil, Pyrex, enamel, silicone and tin are materials which all fit the bill for halogen cooking. Just remember to use a container which leaves a gap of at least an inch from the edge of the oven's main cooking bowl. There are many recipe books for halogen ovens, but you can also make plenty of meals in cooking books which are written for users of a conventional oven - usually it's just a case of reducing the cooking time by around 20% to allow for the fact a halogen oven cooks faster than a standard oven. This calculation does not apply if you intend to bake cakes or bread in a halogen oven - in this situation you should stick to the same cooking time given for a conventional oven. The old phrase 'practice makes perfect' certainly applies when using a halogen oven. Getting used to any new appliance can be a bit challenging to begin with - but a bit of perseverance is all that's needed to ensure you will be cooking with confidence after a few days. Once your confidence grows and you start producing delicious meals in your oven you'll wonder why you didn't take the plunge and invest in one earlier.